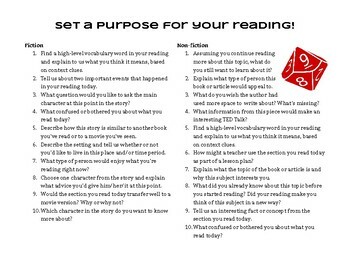 Purpose questions for fiction and nonfiction, using a D10 die! On this sheet, you'll find ten generic questions for responding to fiction and ten for non-fiction. I use this as my Friday warm-up; students choose a question and read anything they want for ten to fifteen minutes, and then they answer their question in a journal. It's helpful to have a ten-sized die for this activity, but you can also have students choose a numbered popsicle stick or roll a die online. (Google "roll D10 online.") You may also want to choose one question for all students to focus on each reading session. However you use it, you'll be happy to have a go-to set of response questions for both fiction and non-fiction!